Designing your custom home in and of itself is a monumental and stressful task. A tip from a professional with many clients under our belt, we highly recommend designing your new home room by room. This creates a sense of accomplishment, and isn’t as overwhelming as doing it all at once. When creating any room(s) you must have a vision about creating a space. In this case, the master bathroom should be a place of retreat and solitude that reflects your style and taste. A master bathroom retreat should evoke your feelings of: Restfulness, relaxation and serenity. Make you master bathroom a place where aesthetics and comfort combine to provide a relaxing haven for restful, restorative self pampering. This includes a specific, soft palette of color(s), striking combination of light fixtures, along with natural light and complimentary tile along with his and hers vanity, and the ideal tub and shower combination which will create your own special oasis. See our photos of our multi-award winning master bathrooms throughout the post! What immediately grabs your attention in a master bathroom? Let us help you answer this question, some of the features/elements that should stand out in a good way are: Your bath tub, tile pattern/flooring, window placement and hardware choices. Some things to consider here are a Roman tub, a freestanding soaking tub or a jetted tub. Roman tubs often times are much larger tubs, so this will take some consideration on your part, on how you will use your tub and the space it will take in the room. Large roman tubs make a statement and accent the room, but if you are one who enjoys a soaking tub, a smaller free standing tub may be a better choice, as pictured below. Another consideration is a jetted tub. If you prefer the health and therapeutic benefits of a jetted tub, this may be for you. Jetted tubs are often more cost prohibitive. When choosing hardware for a master bathroom, there are a wide variety of faucets, shower and tub filler spouts to consider; including ones that fill your tub from the ceiling. Another favorite feature of our clients is an in-line heater system to your tub to help keep the water a warm, and at a soothing temperature, however this doesn’t come without an additional cost. 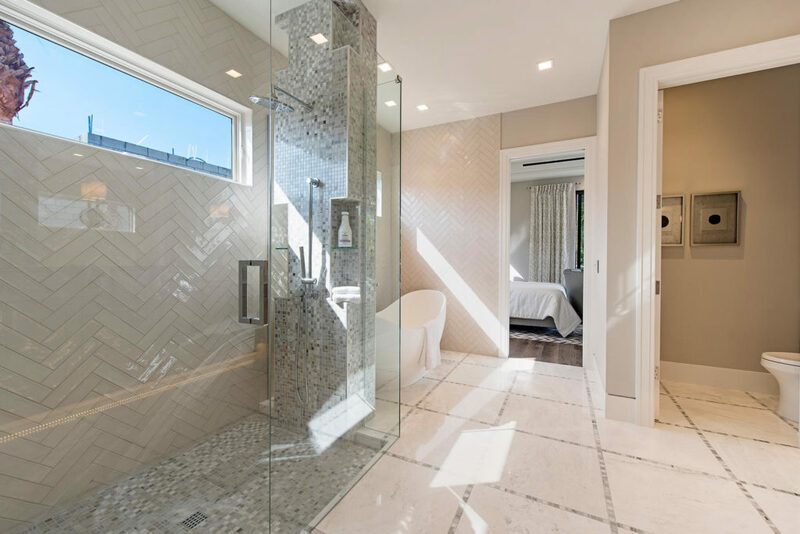 A common feature in custom homes is a walk-in shower. These may come with full body sprays and/or dual shower heads. Another upgrade clients often request is a shower with motion jets or in some cases, full motion body jets. Therefore, it’s imperative that you talk to your custom home builder ahead of time about having more than adequate water pressure for this feature. Dual shower heads or even rain shower heads (mounted on the ceiling of the shower), add another pleasing effect to the overall master bathroom’s design. The master bathroom decor is defined in large part by the tile work and the quality of materials chosen. The tile and stone work is the place to really make your master bathroom standout. Don’t try to save money here, allocate extra money to this space, this is the place to go all out, and create the master bathroom oasis of your dreams! Vanities provide for individual space in a master bathroom. Each can be arranged and used as they see fit. Functional layout is important here, you’ll want to consult with your designer when you get to this step. In most cases, she will need more space and electrical outlets than he will. In addition to functionality, this is where style can really play a part in the creation of the elegance of your master bathroom. 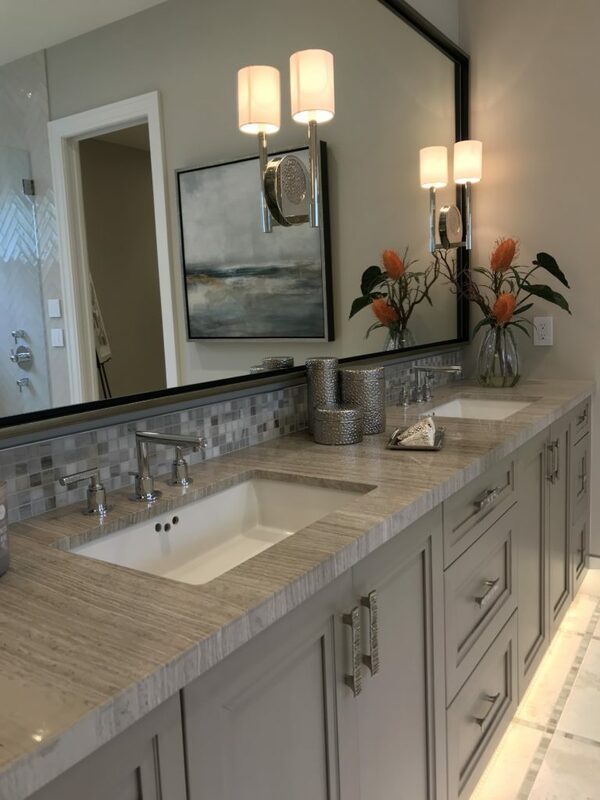 This is another place to go all out therefore, hardware and decor that you select can dramatically change the look and experience of your master bath. Functionality is vital to the day to day use of the space. Custom pocketing doors, wet shelf, pool, spa, fire pit and luxury outdoor kitchen in one of KTS’ custom homes. When you choose to build with a custom home builder, you won’t be limited by the cookie-cutter architecture that developers are limited to. Even in upscale neighborhoods, you’ll likely see a lot of uniformity in design style and home features, often times calling themselves custom home builders; when in fact they’re production semi-custom homebuilders. If you’re looking for a home that reflects your personality and is unique to your style, building a custom home may be the perfect choice for you! Ultimately, a custom home builder will provide you with the most flexibility, the most options, and the best quality work. If you’re looking to build a custom luxury home in Southwest Florida, we can help.